Download as > ODP Document (.odp) to download your presentation as an ODP file. The file will be saved to your default download folder. With this update, you can now import and export all three major OpenDocument file formats: .odt files for documents, .ods for spreadsheets, and .odp for presentations. Please note that some formatting (e.g. tables and complex shapes) may be lost during file conversion. Being able to save Google Slides in the OpenDocument Presentation (.odp) file format has been a popular request from the open-source community and organizations that use open-source office suites, such as LibreOffice and OpenOffice. 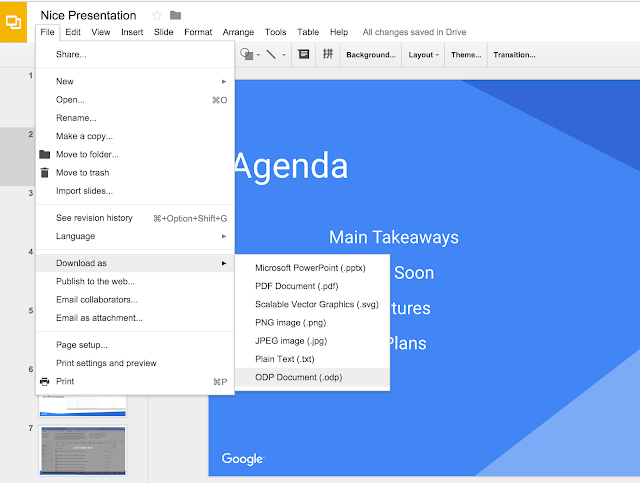 Starting today, you can download your Google Slides presentations in the ODP file format. From a Google Slides presentation, click File > Download as > ODP Document (.odp) to download your presentation as an ODP file. The file will be saved to your default download folder.